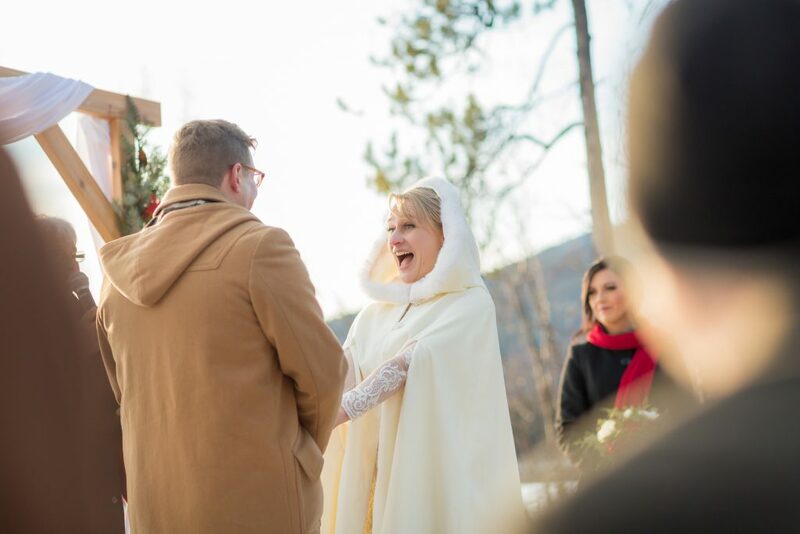 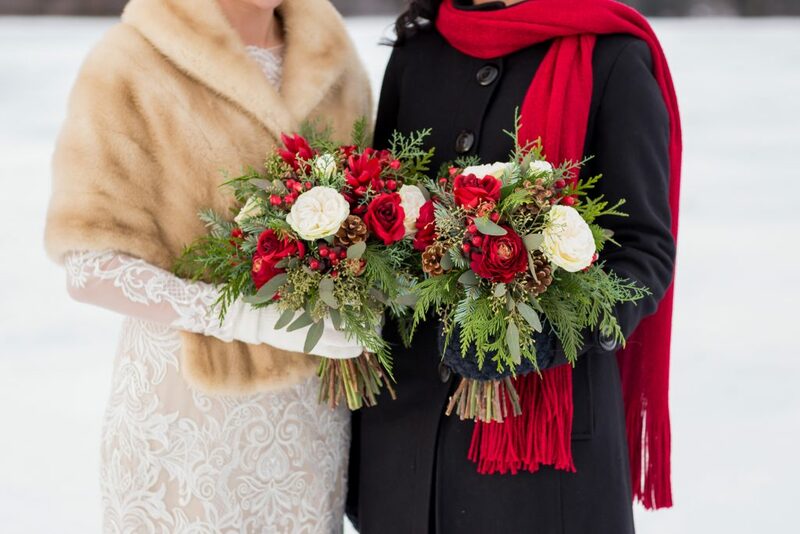 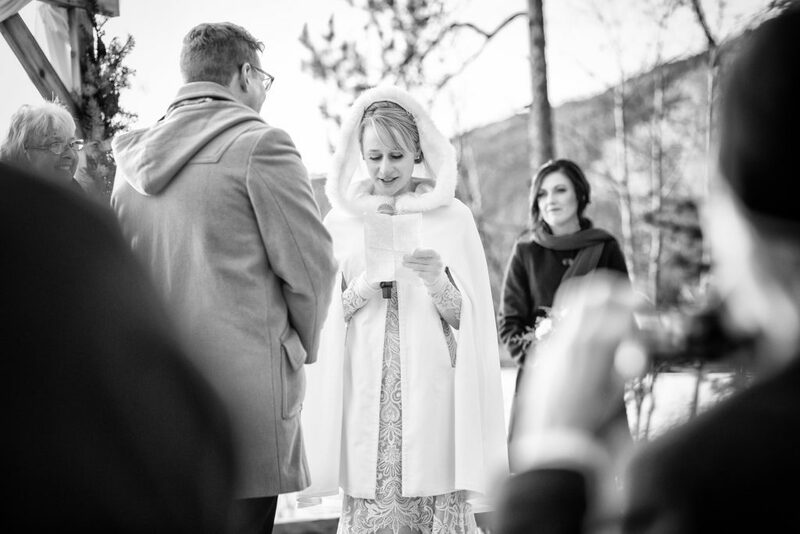 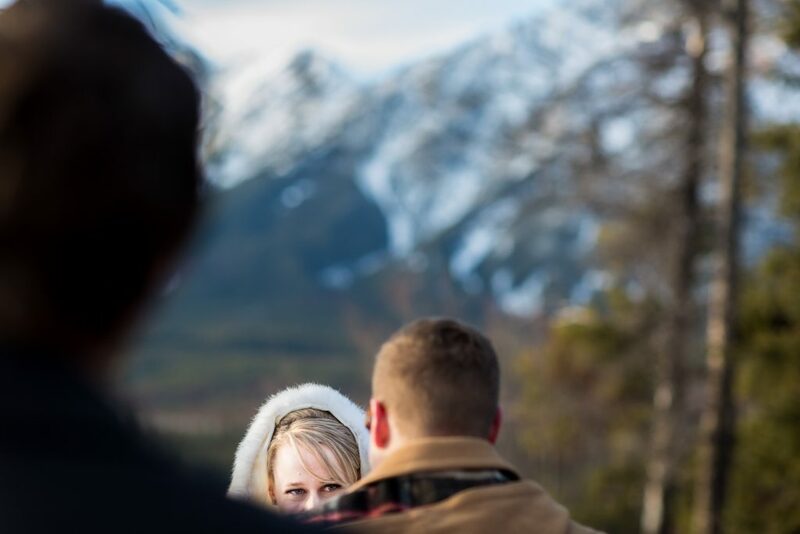 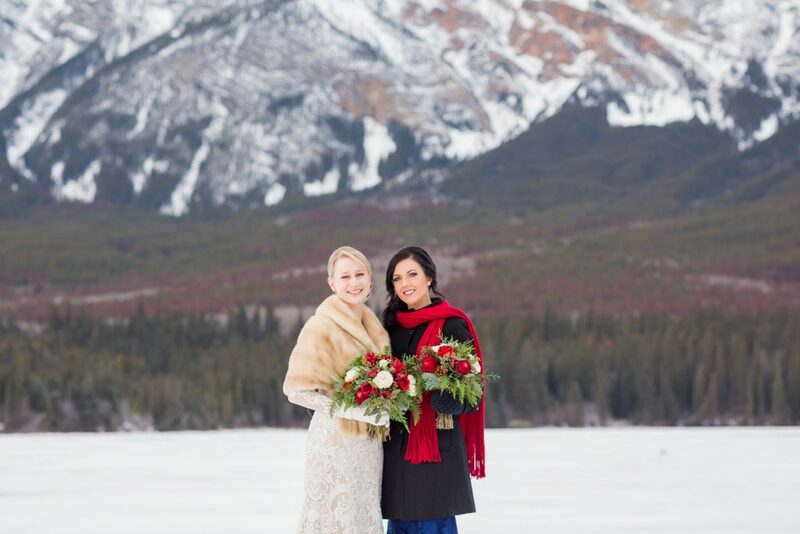 If you’re going to get married in the winter, it should be in the mountains. 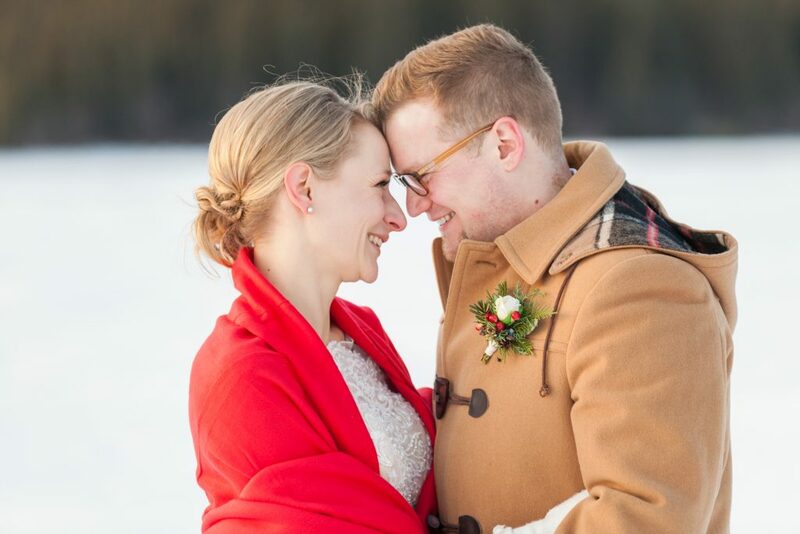 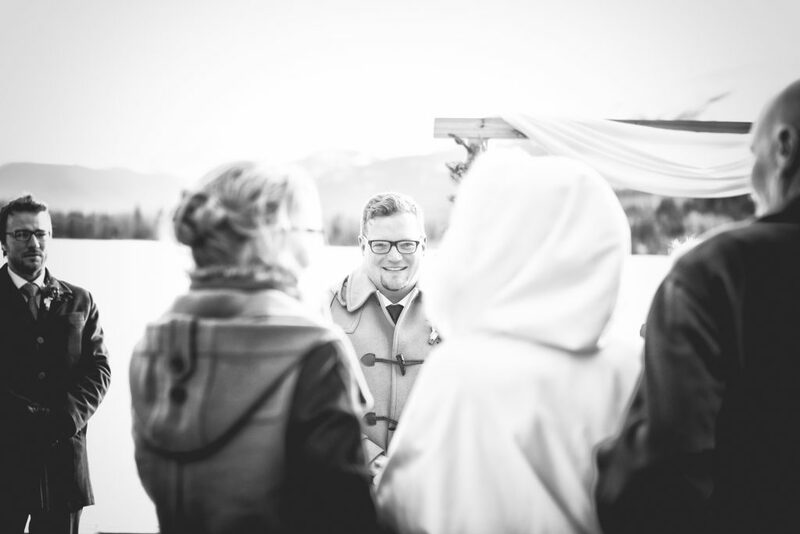 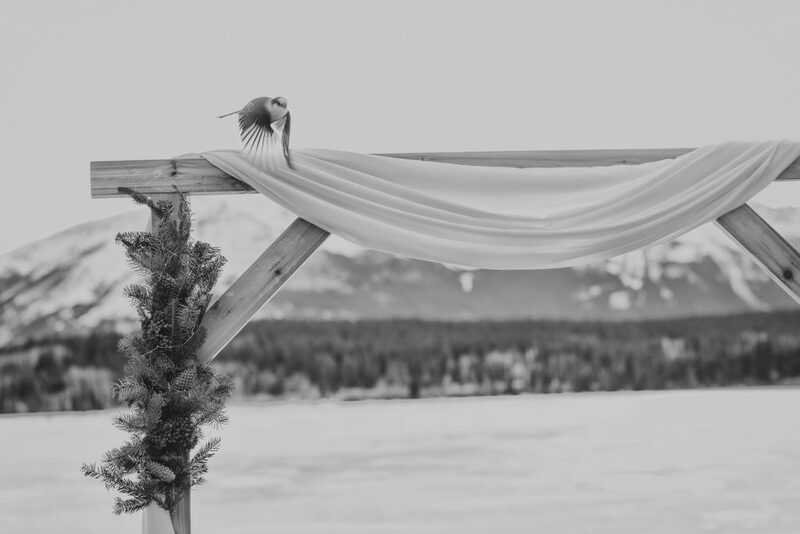 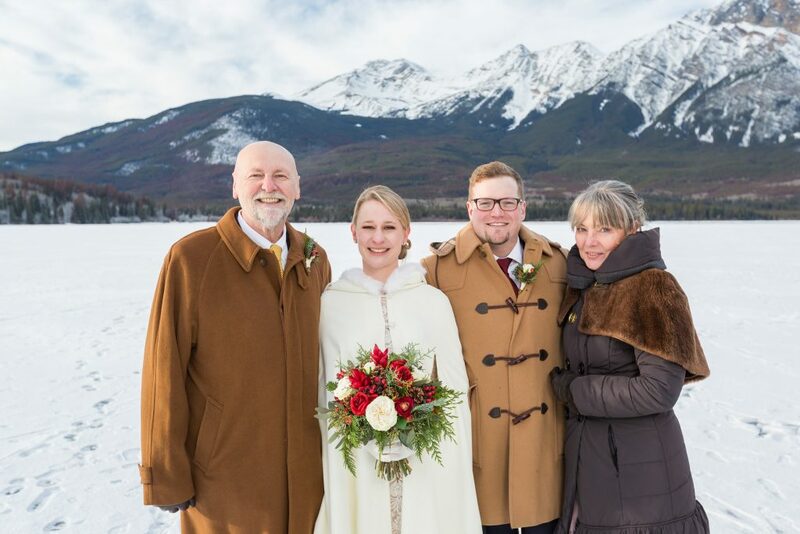 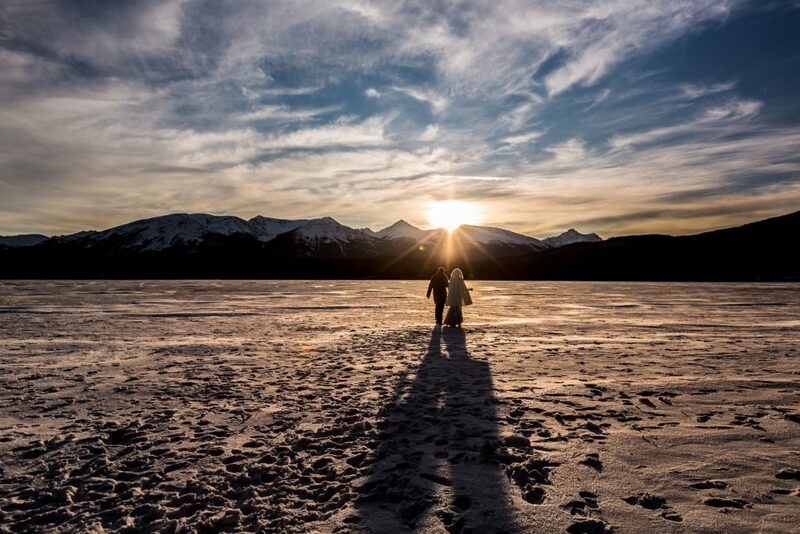 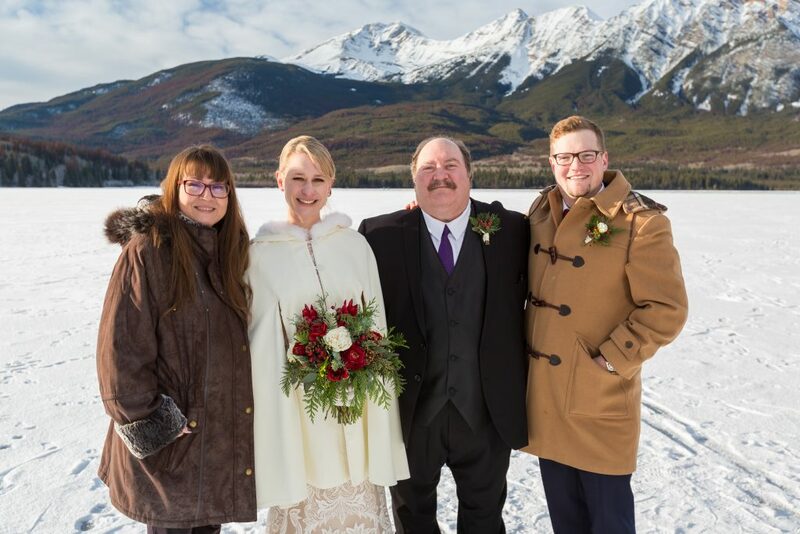 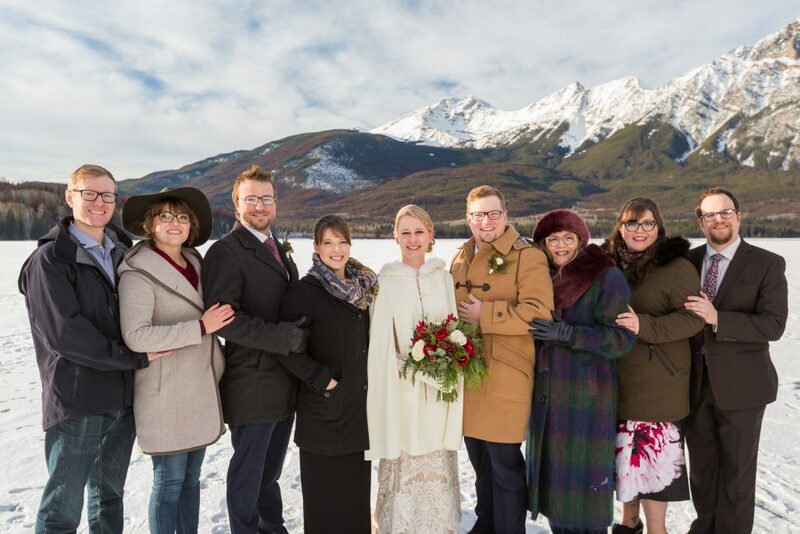 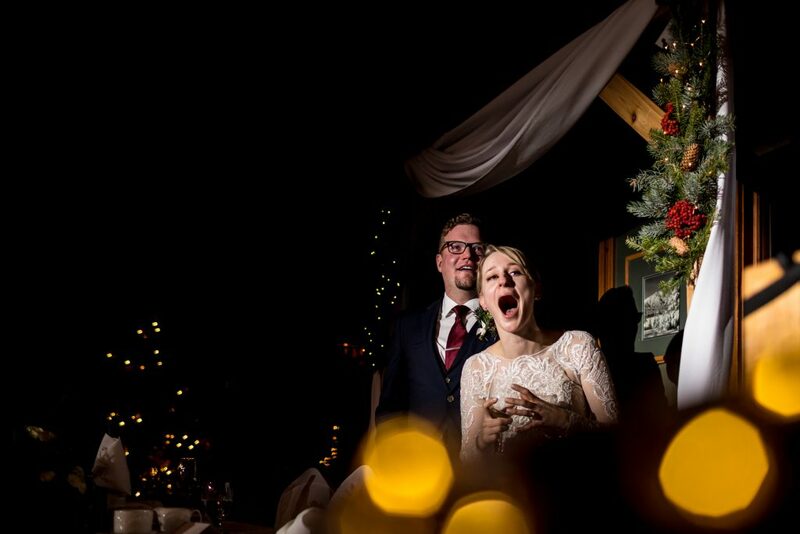 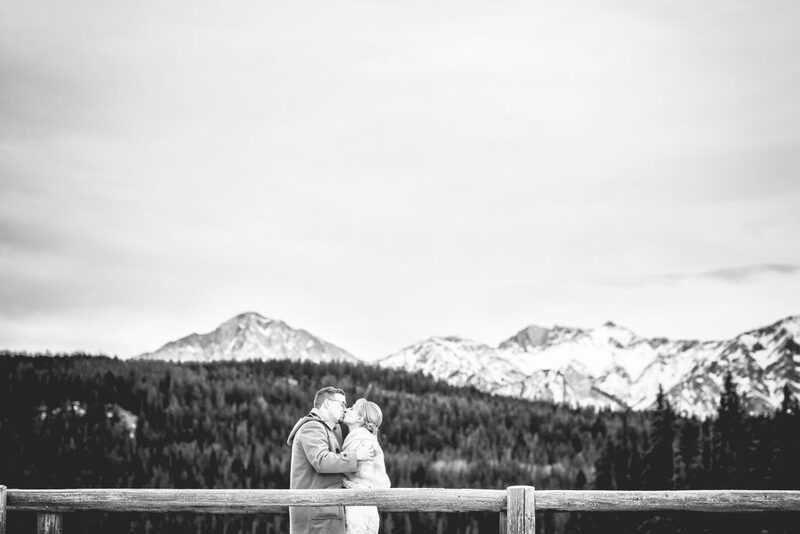 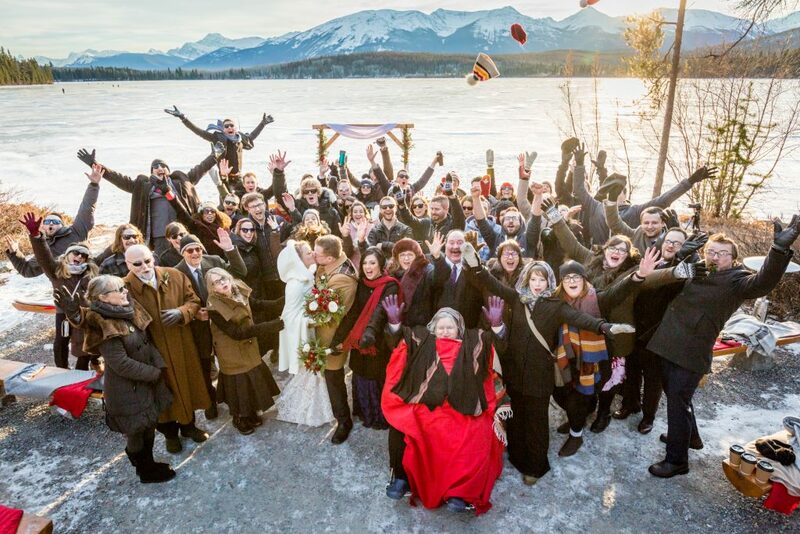 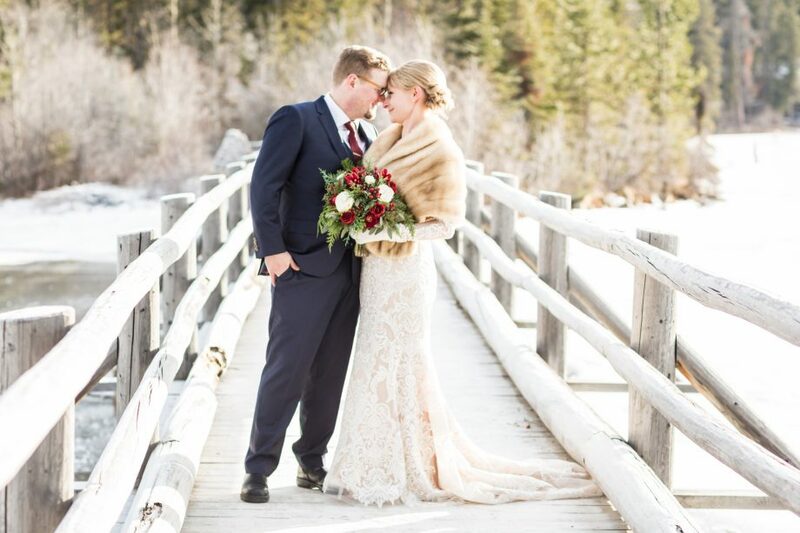 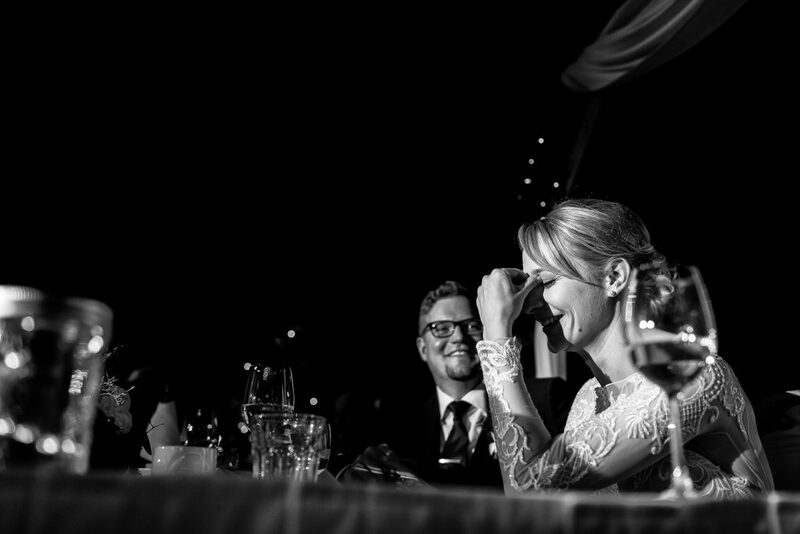 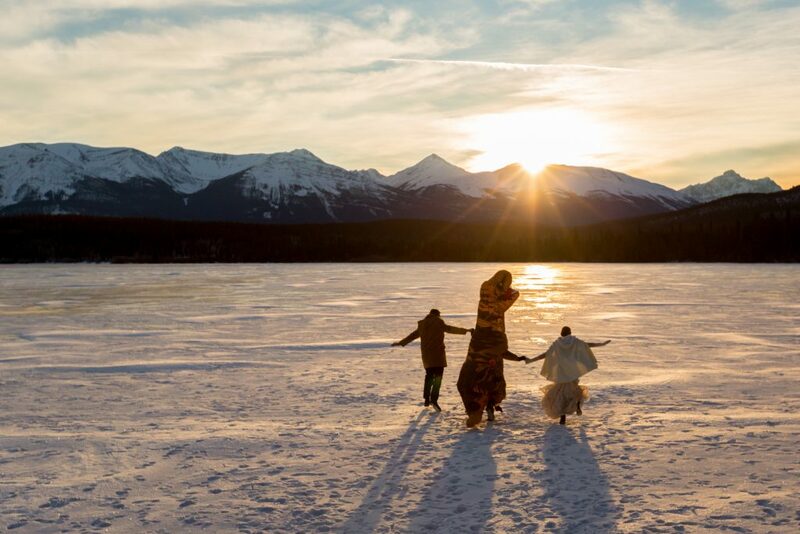 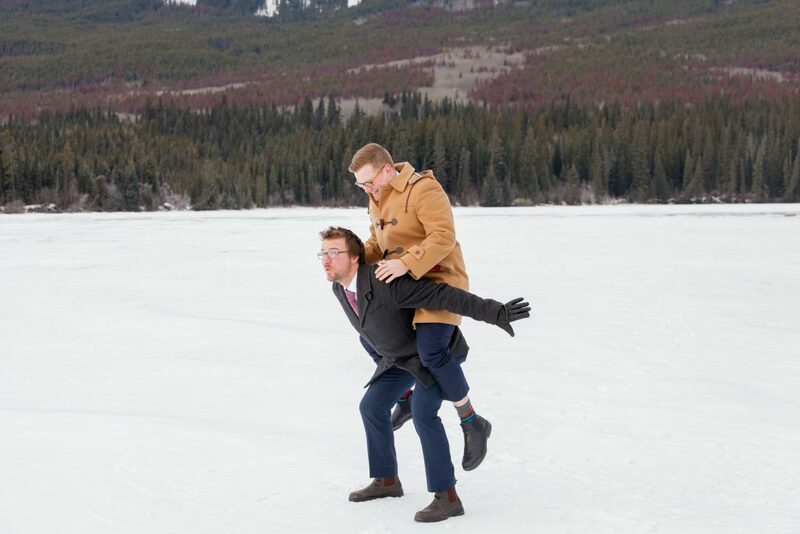 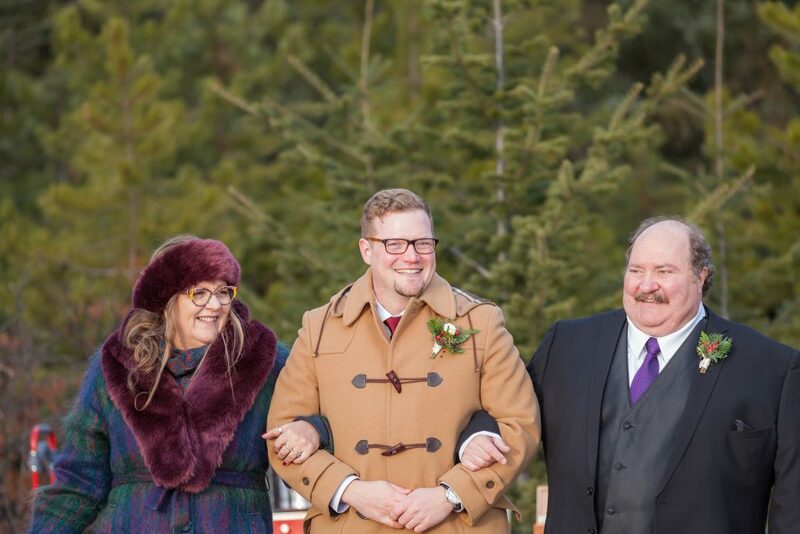 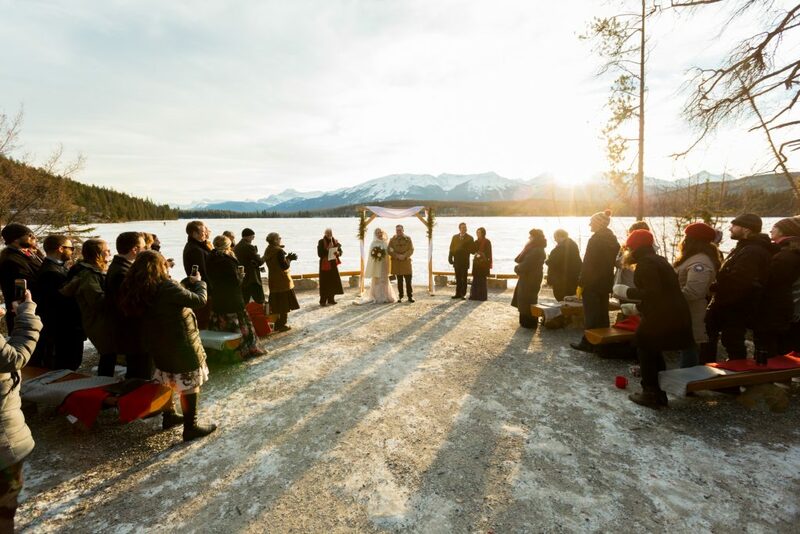 Michelle and David’s winter wedding Pyramid Lake was snowy, cozy and oh so romantic. 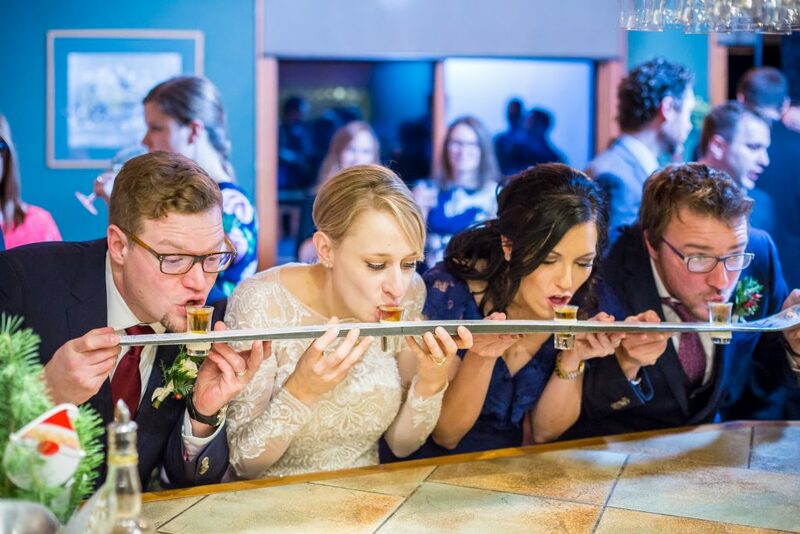 Everything you could wish for on your wedding day. 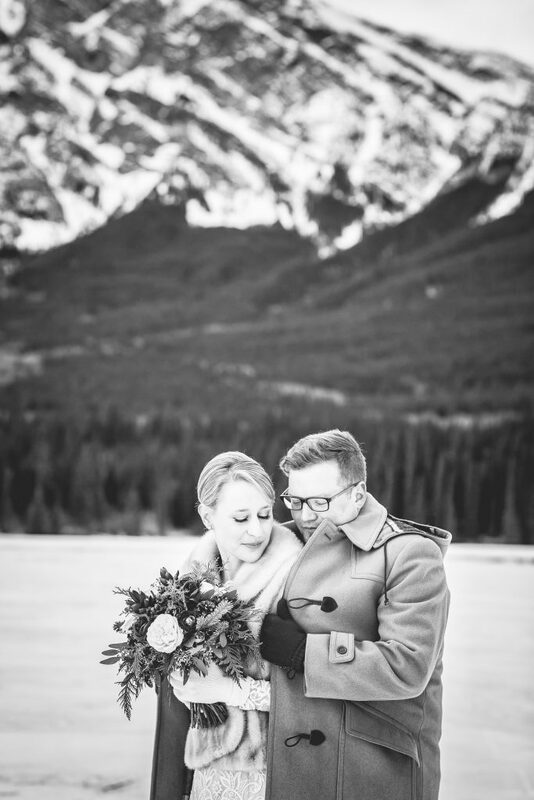 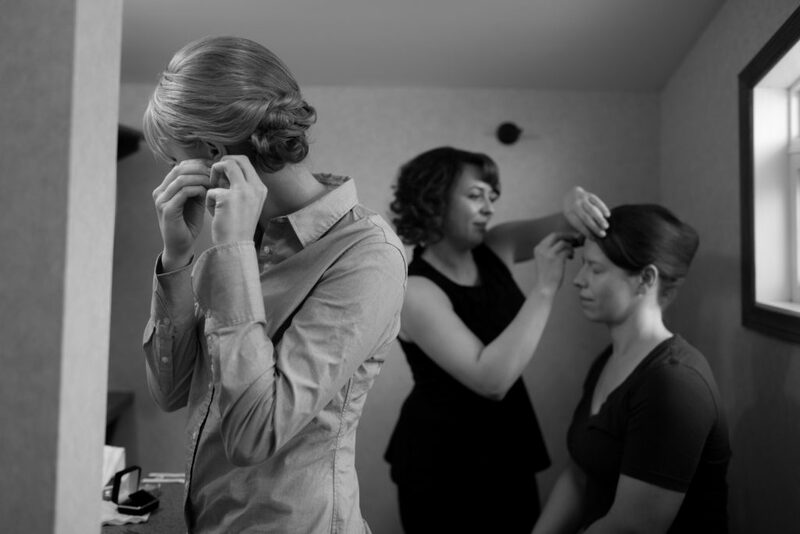 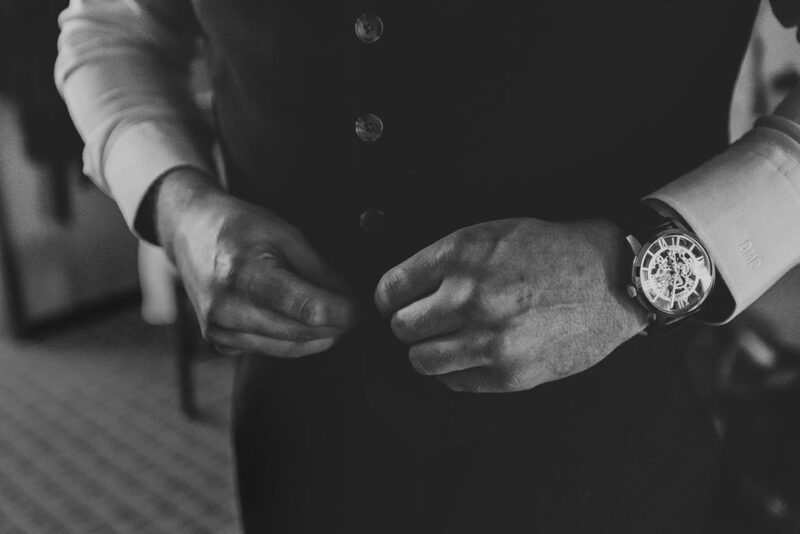 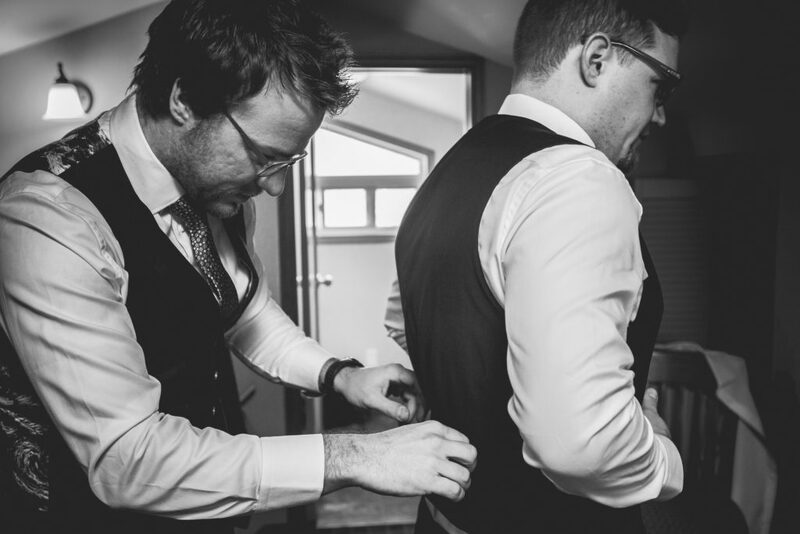 David and Michelle are bold, daring and love a good adventure; so planning and outdoor winter wedding seemed only natural. 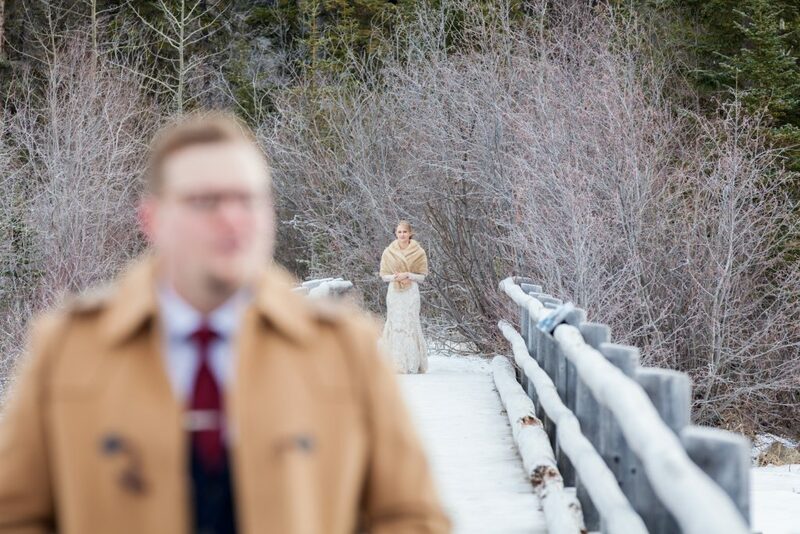 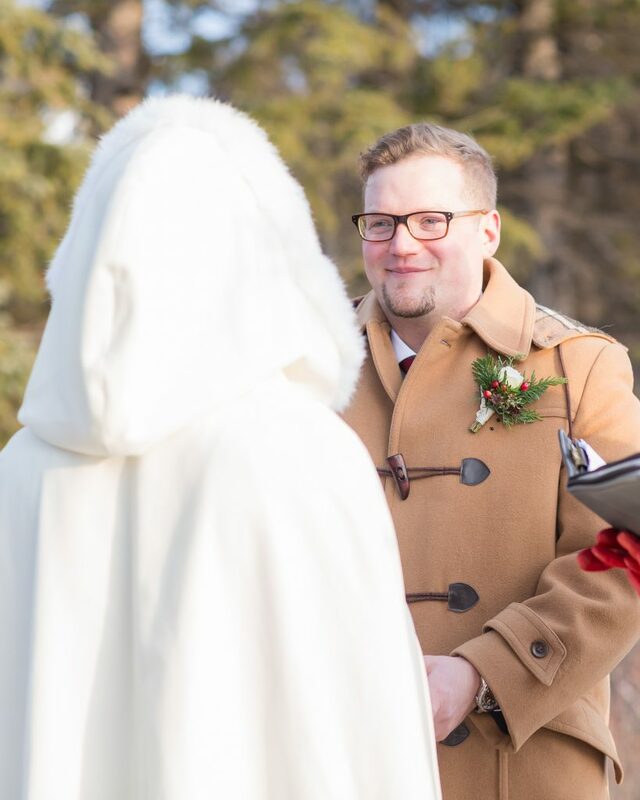 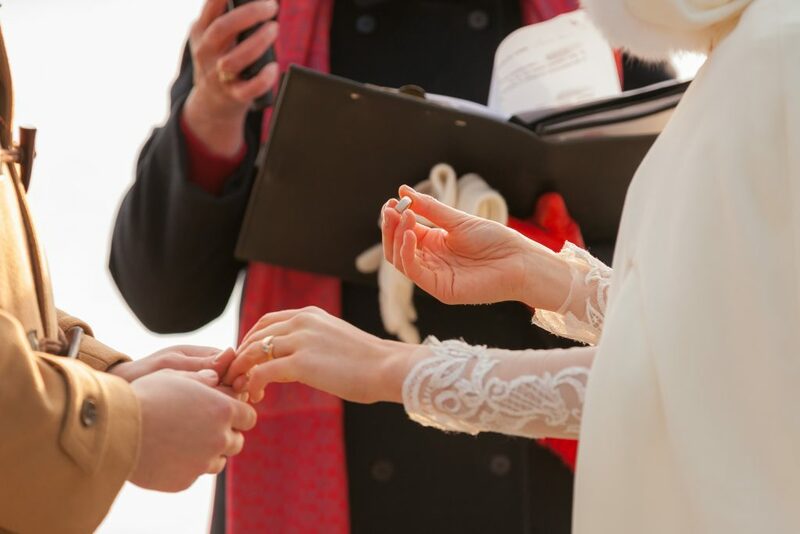 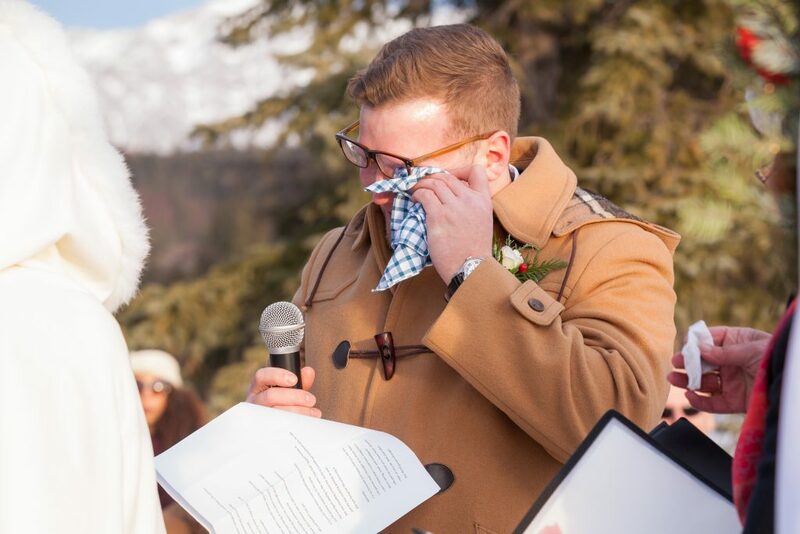 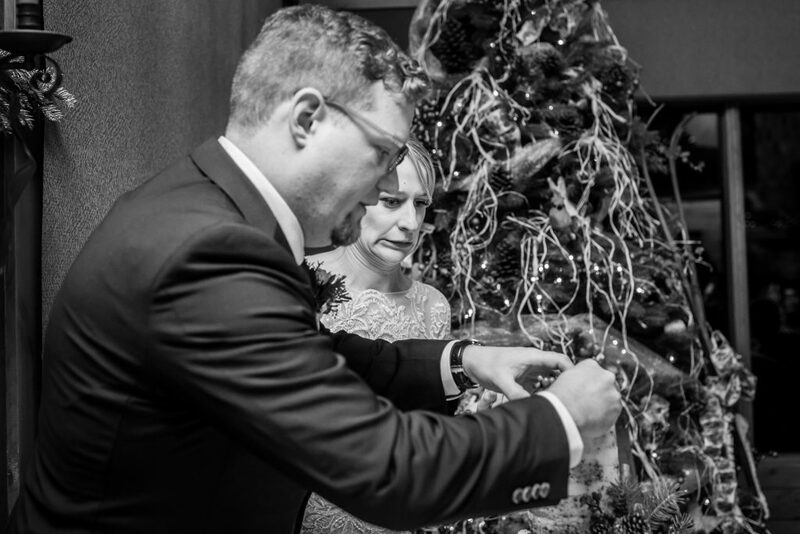 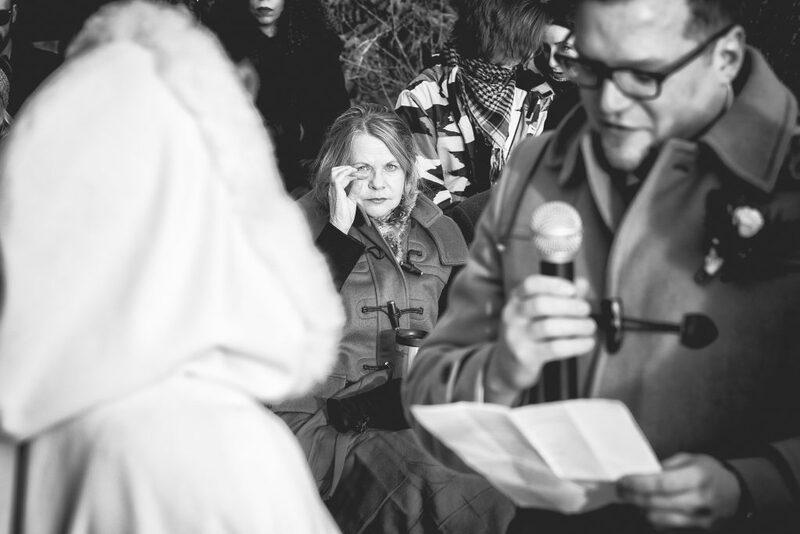 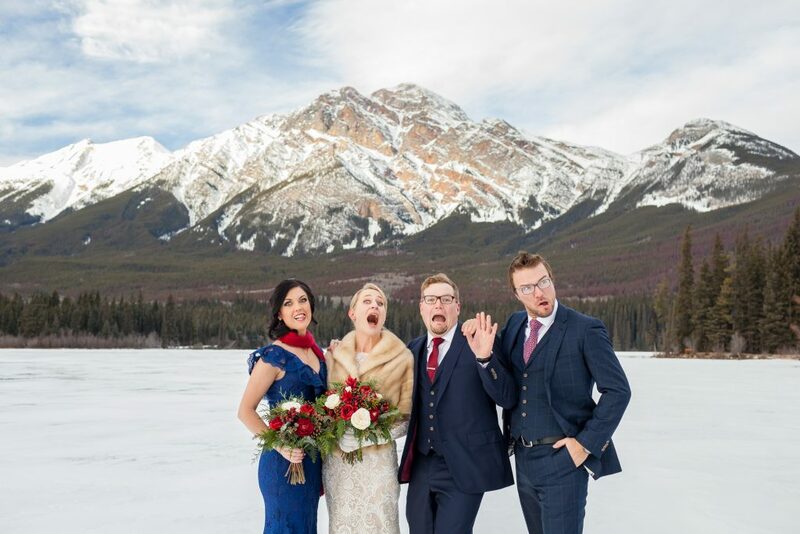 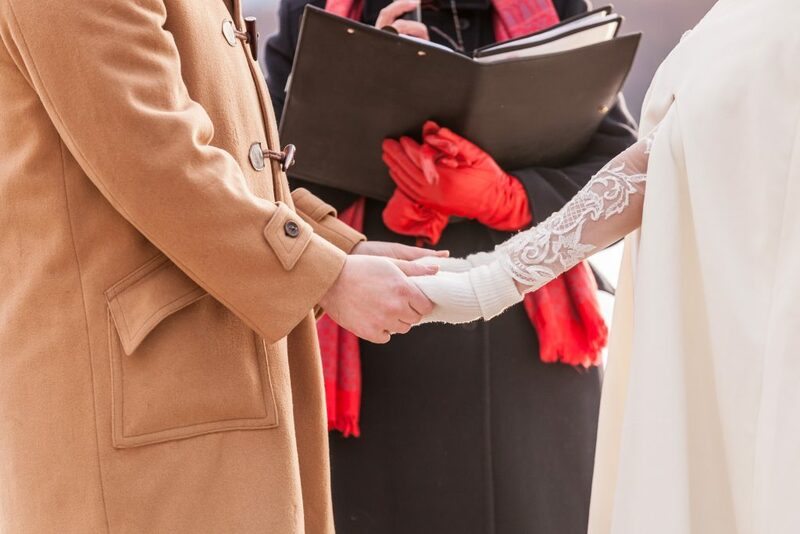 As luck would have it, the weekend of the wedding saw balmy winter temperatures just below zero. 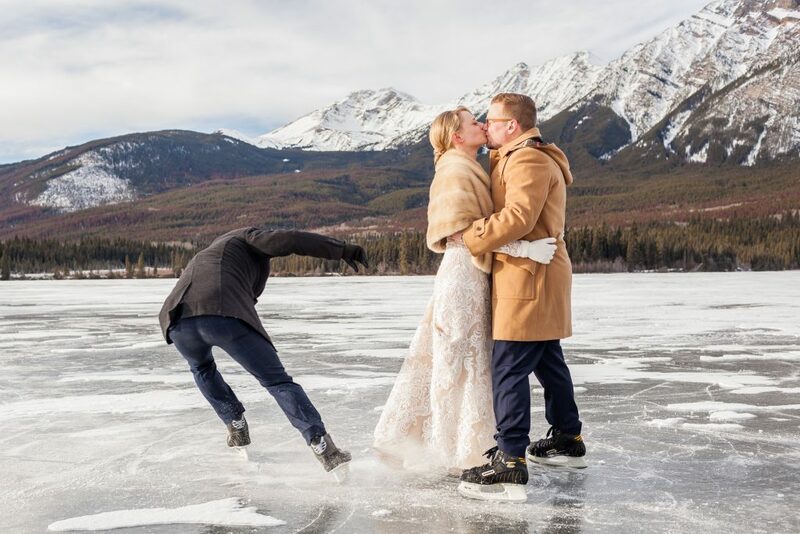 The fresh snow on Pyramid Lake had blown free in some areas revealing dazzling ice just perfect for skating. 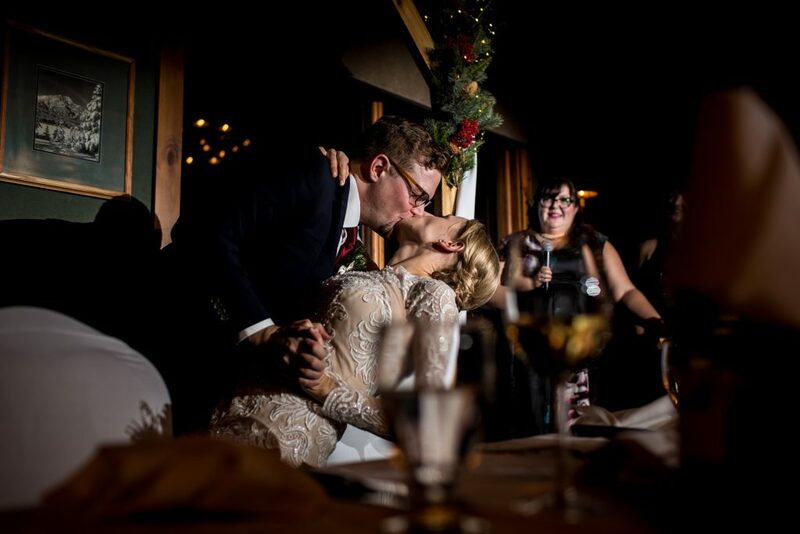 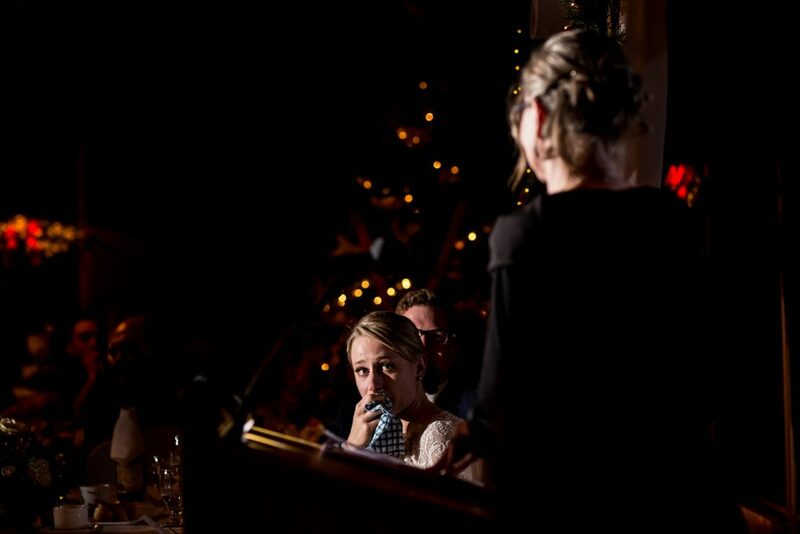 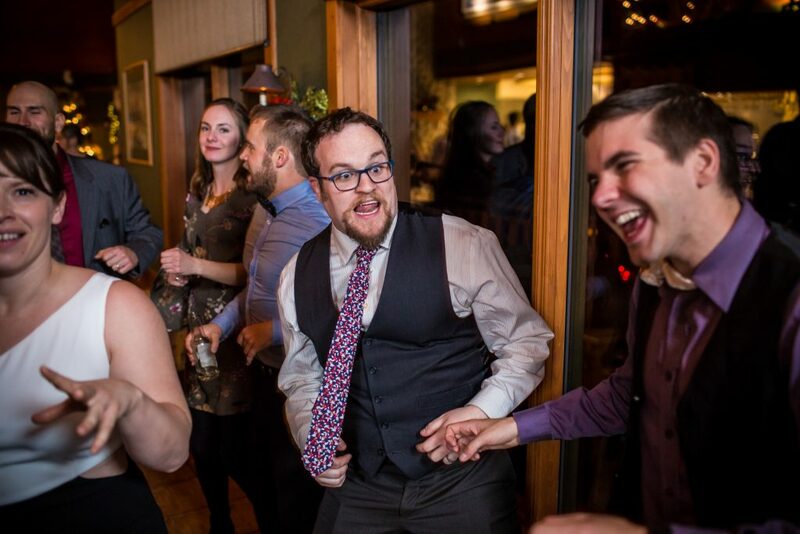 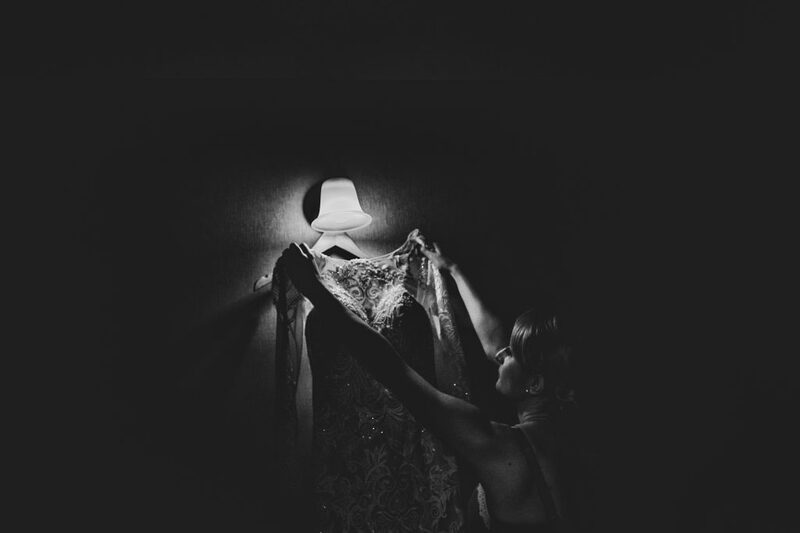 This wedding was magical. 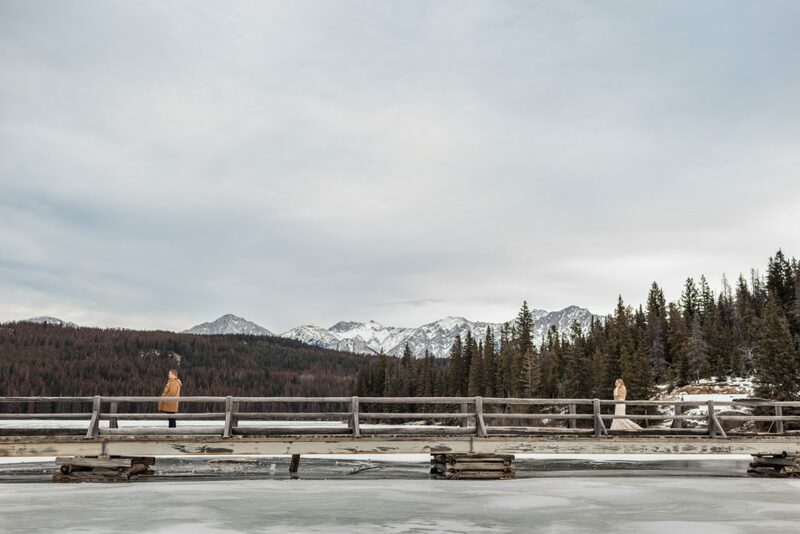 A long wooden walking bridge connects the mainland to Pyramid Lake Island and this is where David and Michelle shared their first look on the morning of their wedding. 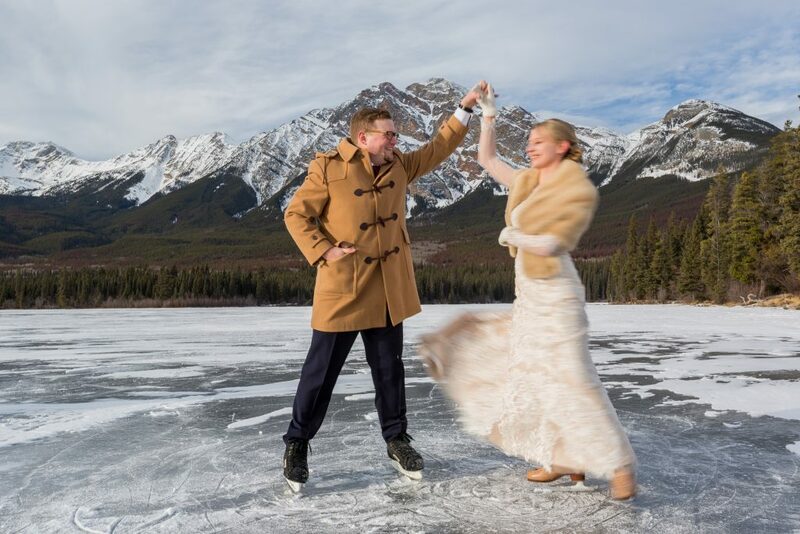 The wedding party soon joined the happy couple for an afternoon of wintery adventure and skating on the frozen lake. 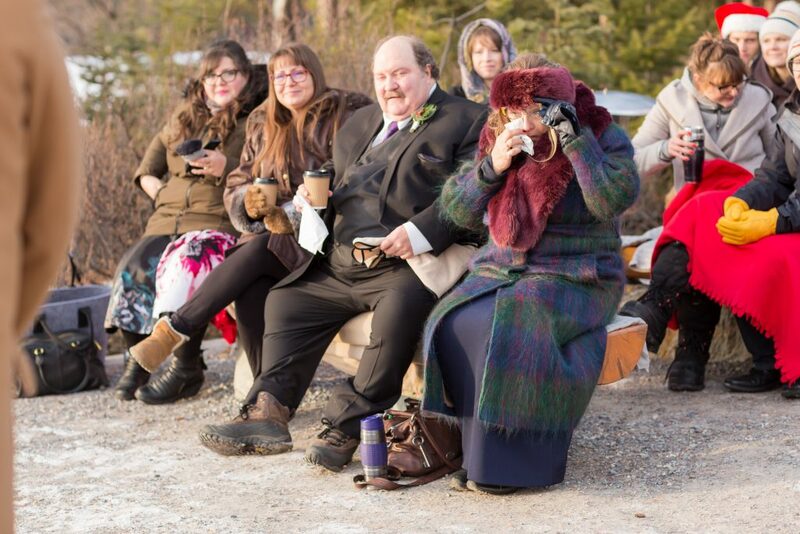 For their outdoor wedding ceremony Michelle and David brought heaters, fire pits and blankets to stave off the winter chill. 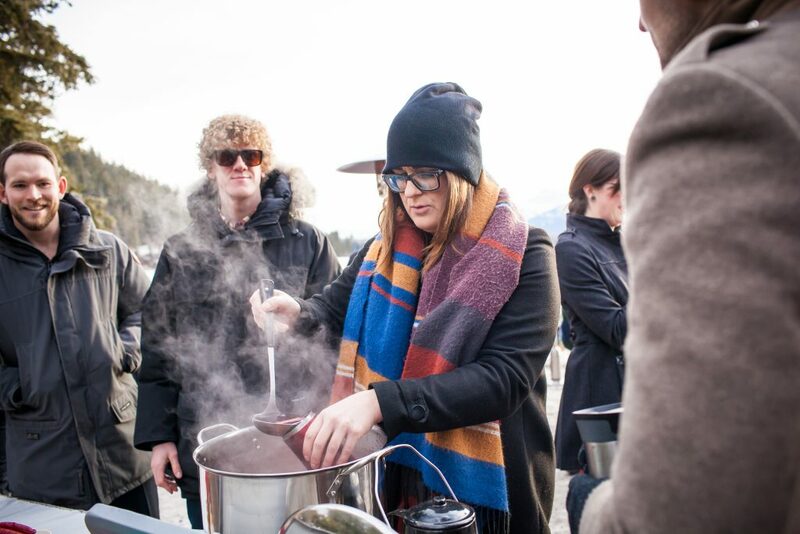 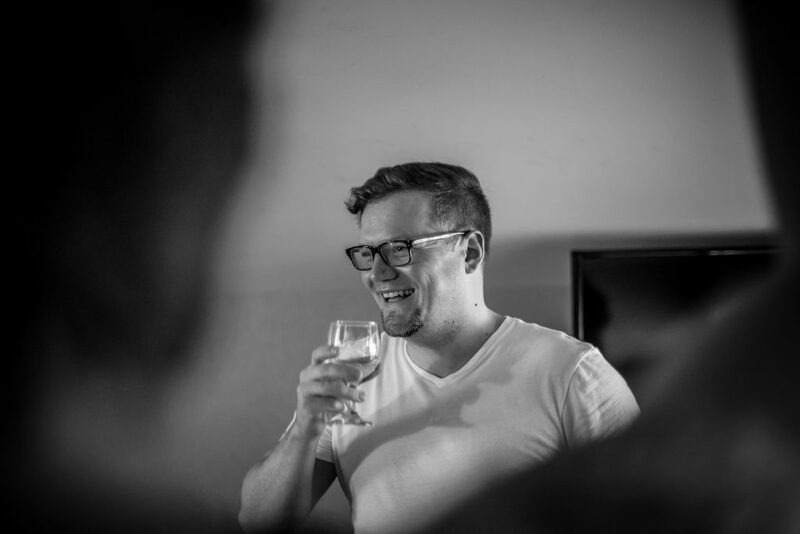 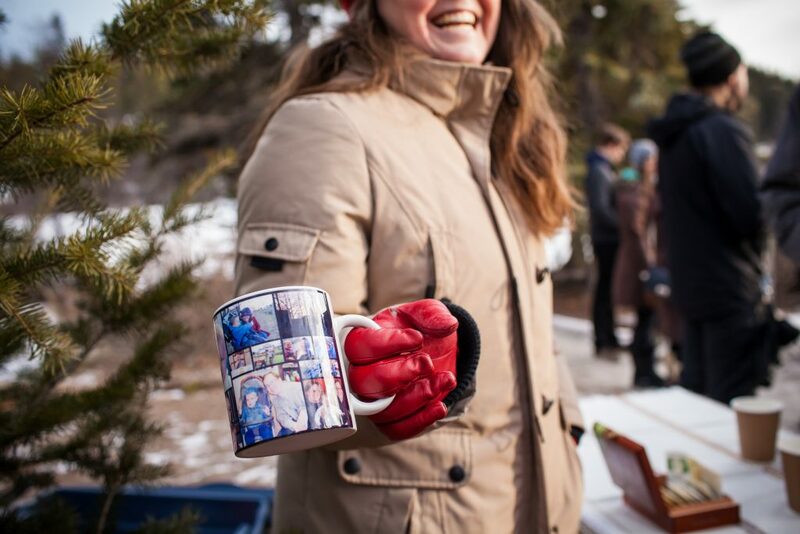 Guests were invited to bring their own mug for the homemade mulled wine and tea that were served during the ceremony. 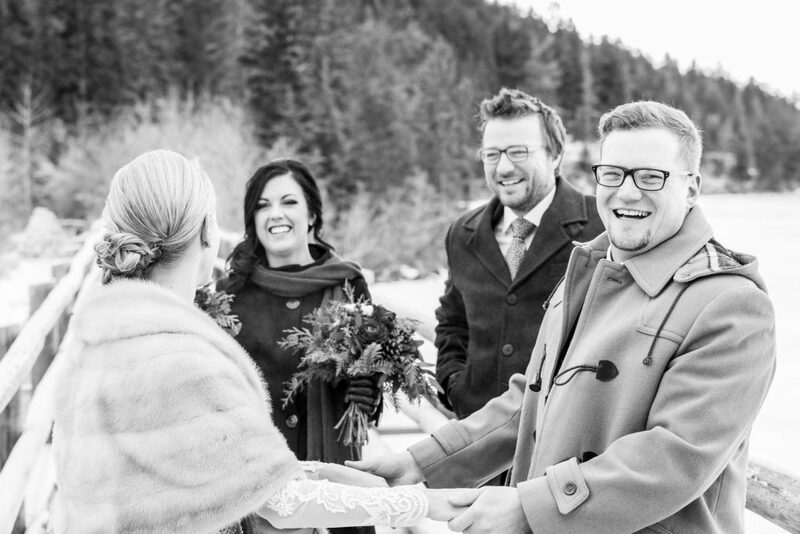 Michelle and David greeted their guests in an informal receiving line following the ceremony. 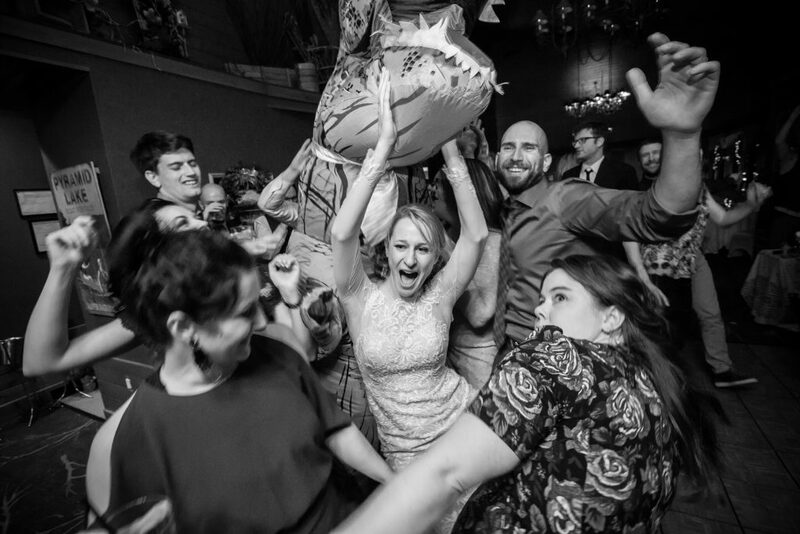 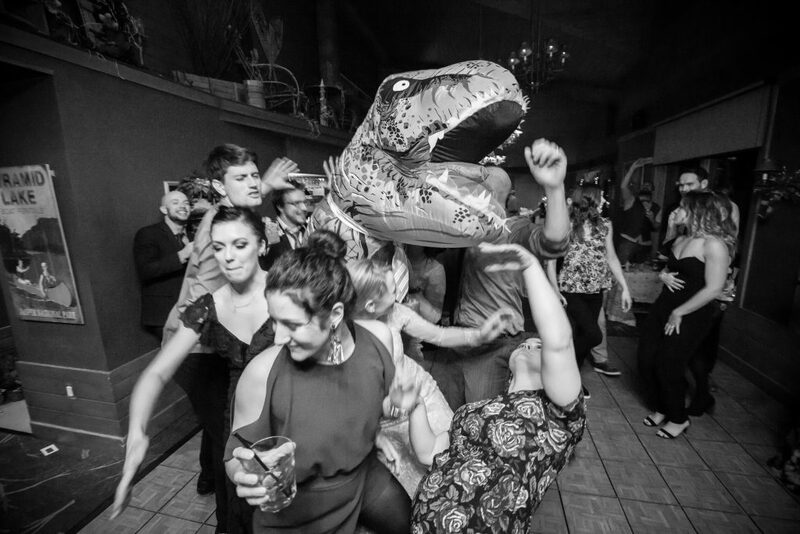 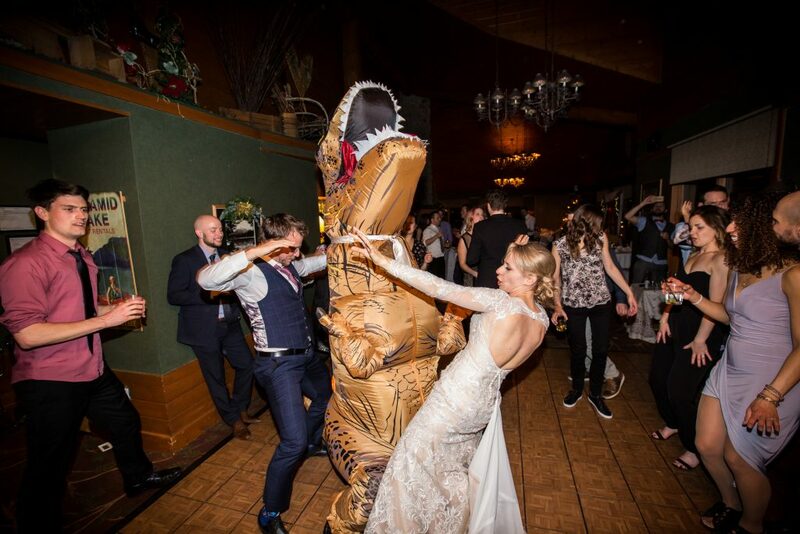 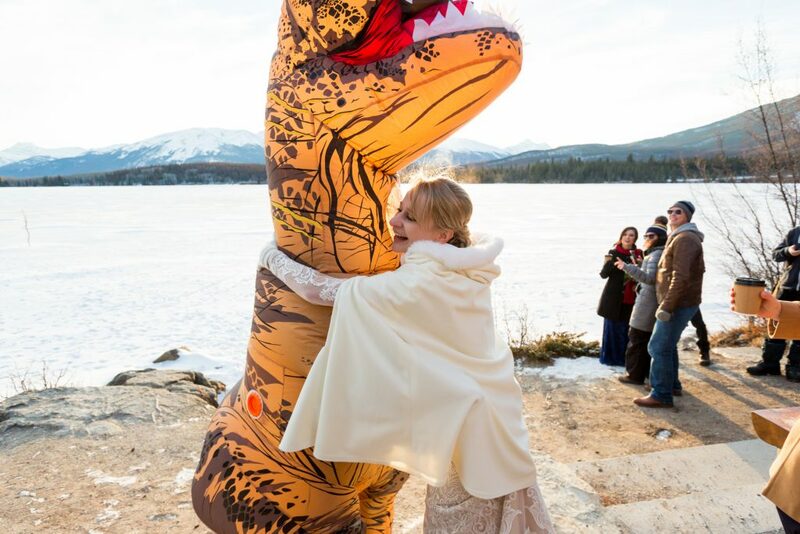 Suddenly, from behind the trees a T-Rex came bounding in, grabbed the hands of the newlyweds and they all ran off across the lake into the sunset. 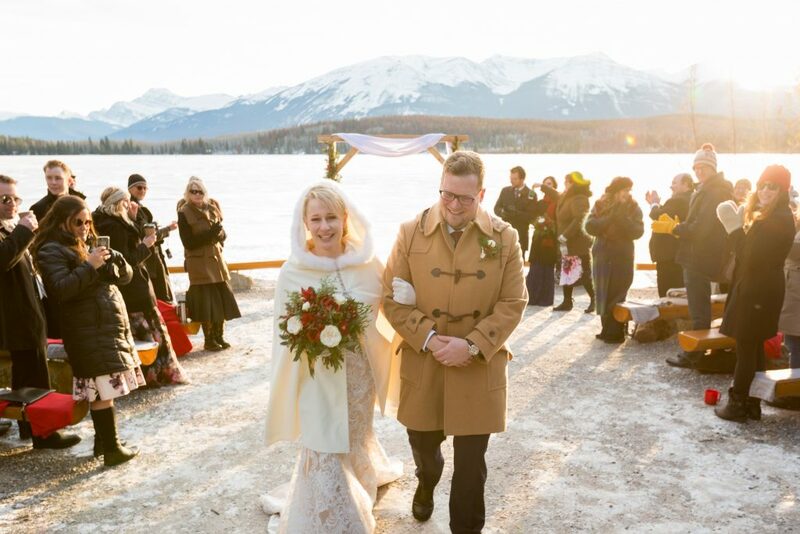 This was the most spectacular wedding exit we have ever seen. 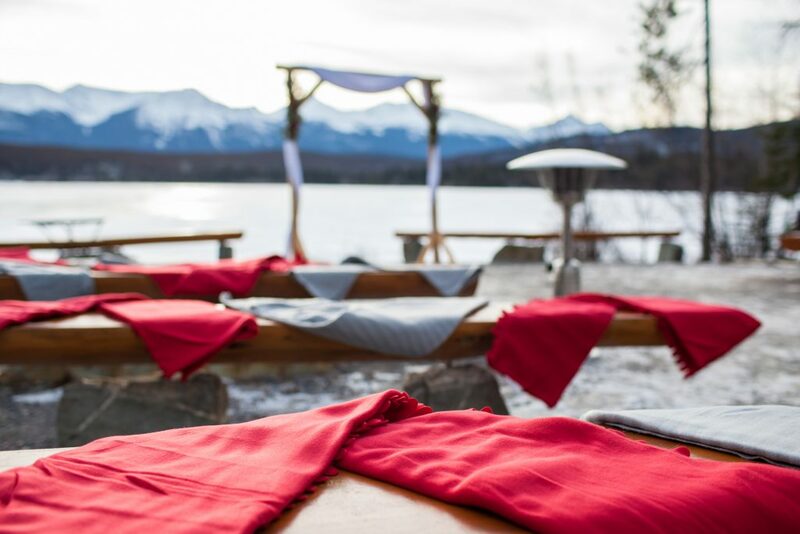 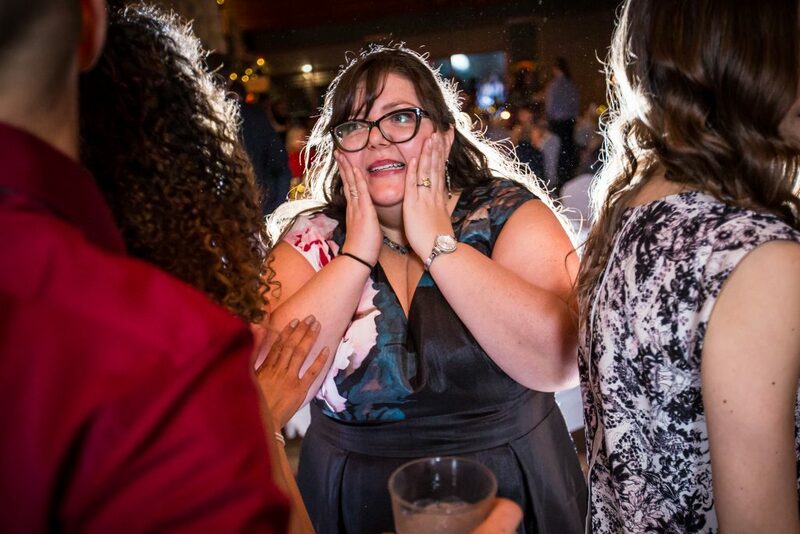 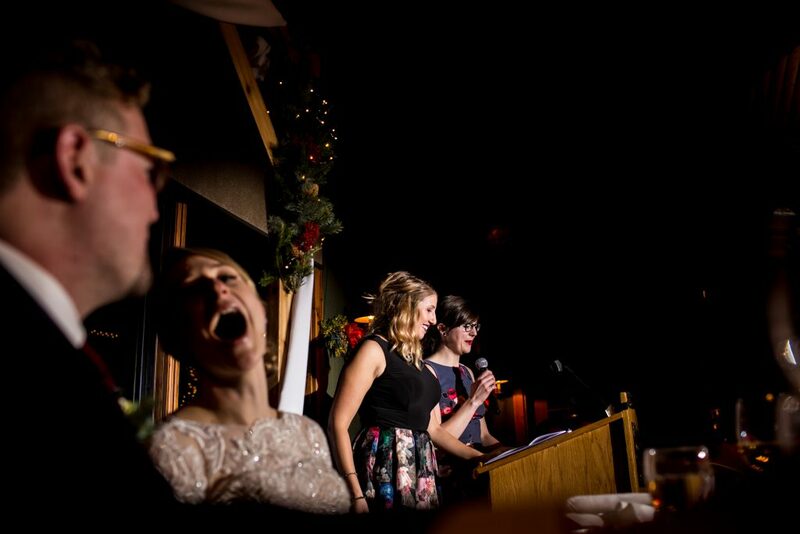 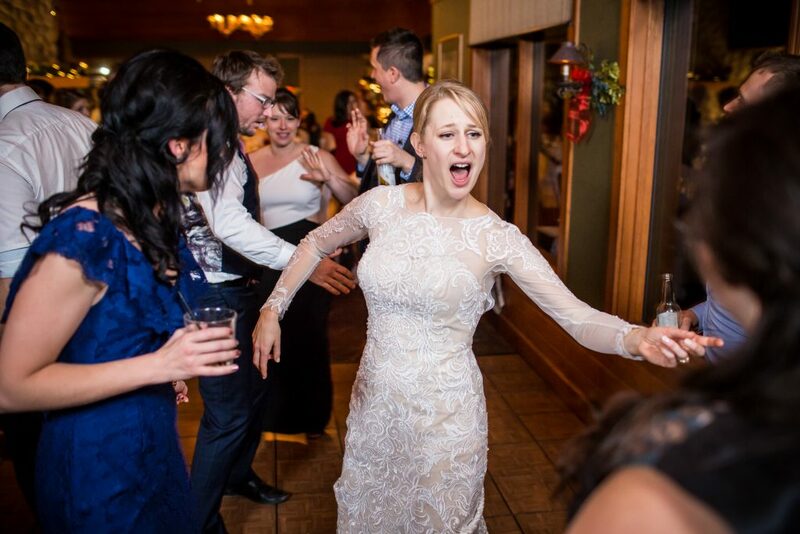 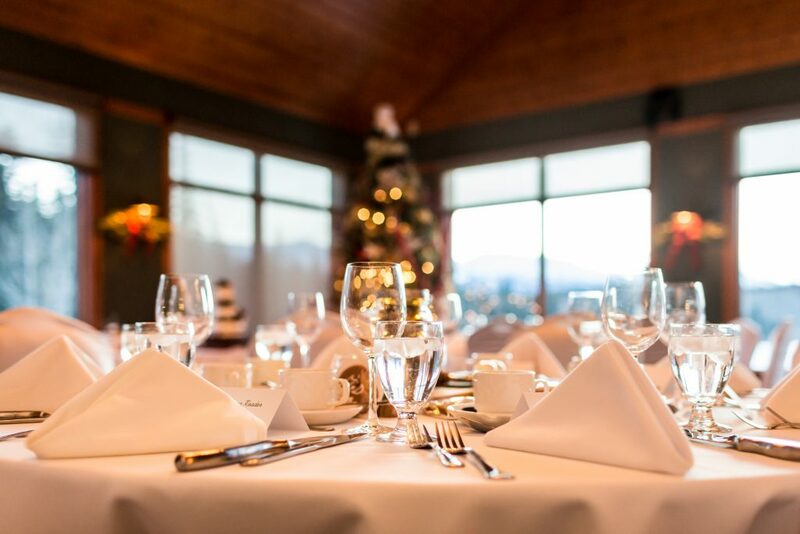 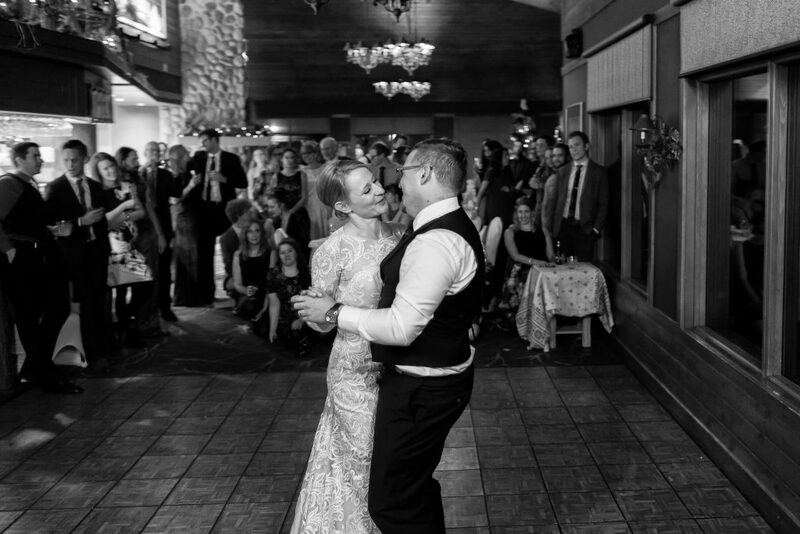 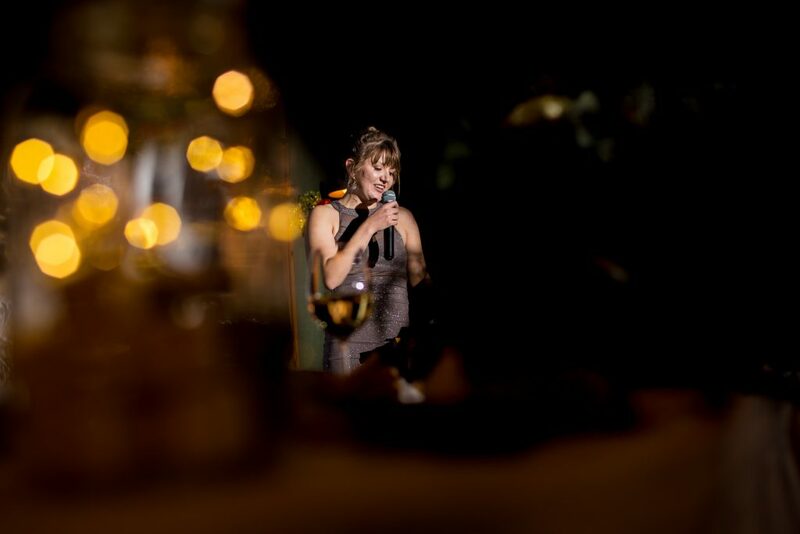 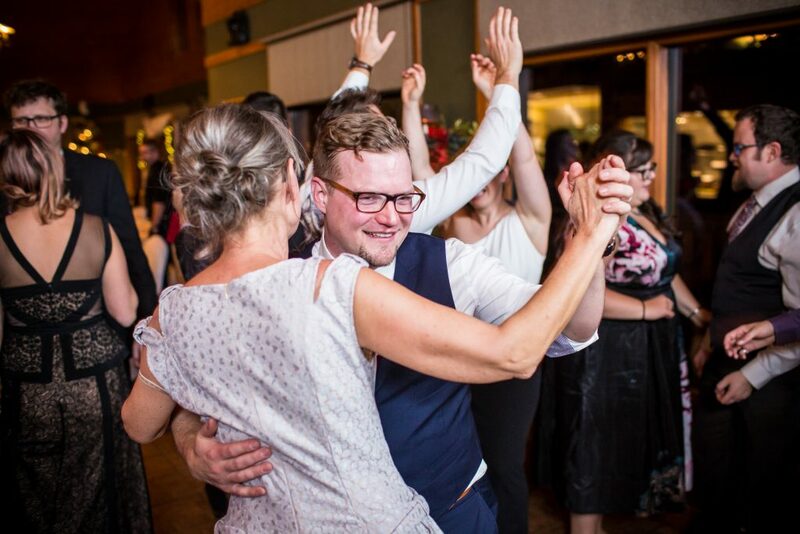 The intimate wedding reception was held at the Pyramid Lake Resort’s Pines Restaurant. 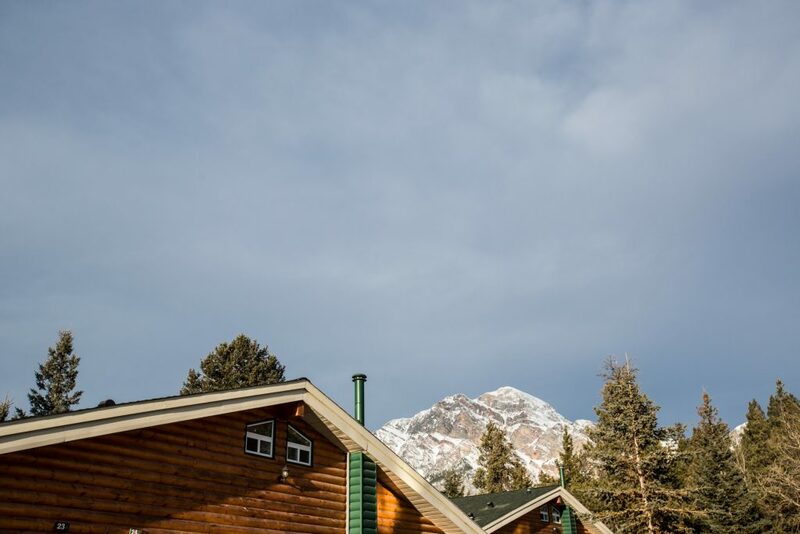 A rustic log cabin with high timber ceilings, a beautiful stone fireplace and a wall of windows overlooking the lake. 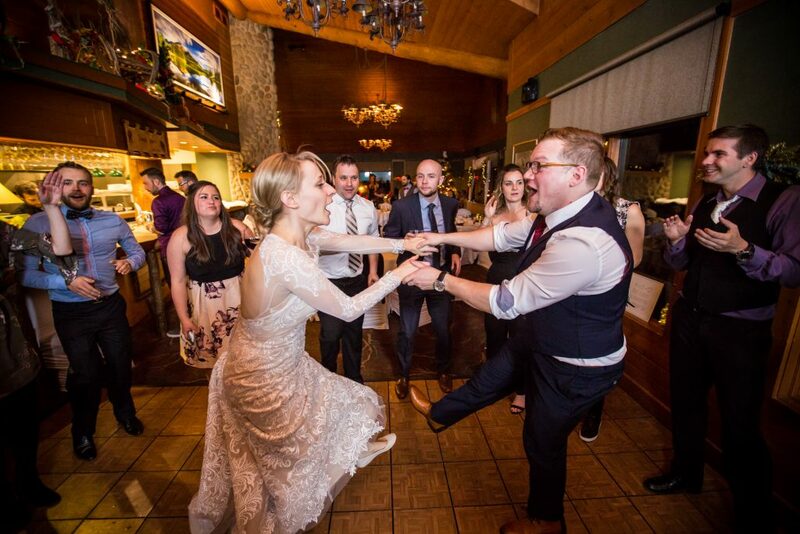 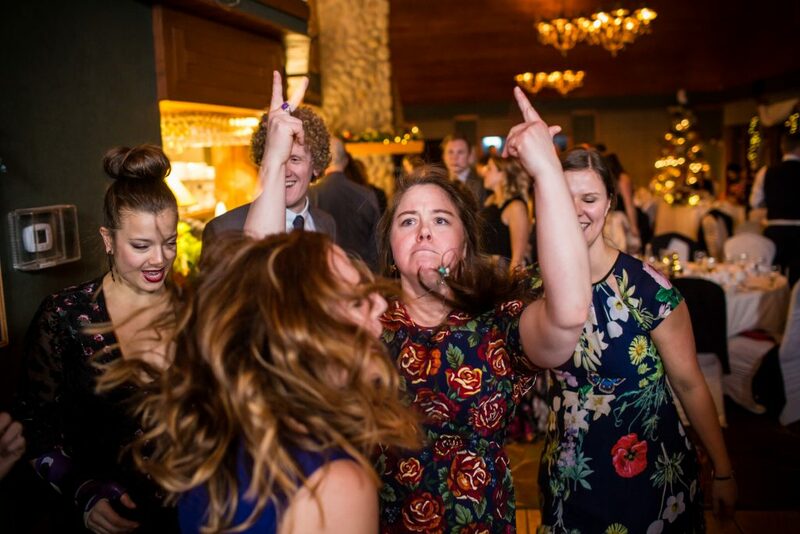 The newlyweds wasted no time in getting the party started and soon the dance floor was open and the music was pumping. 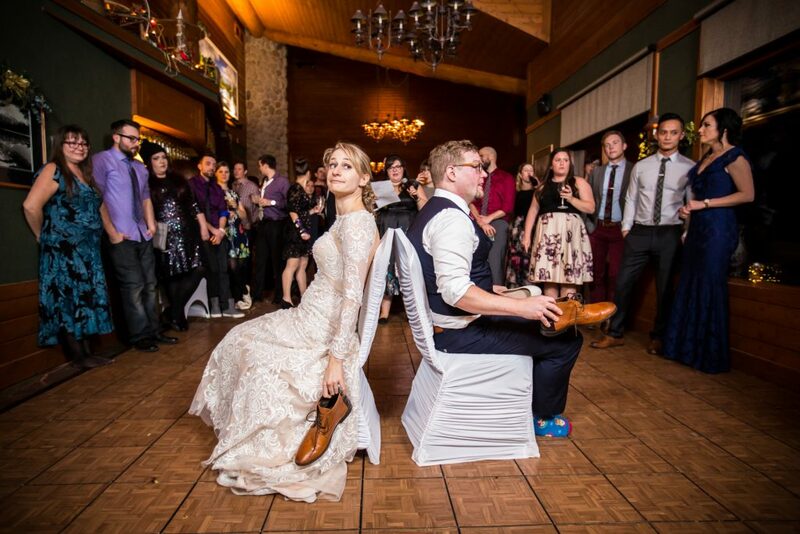 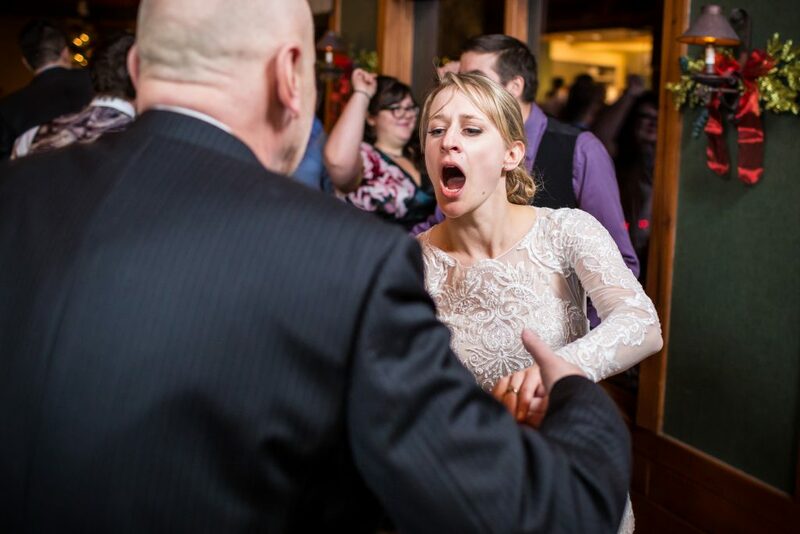 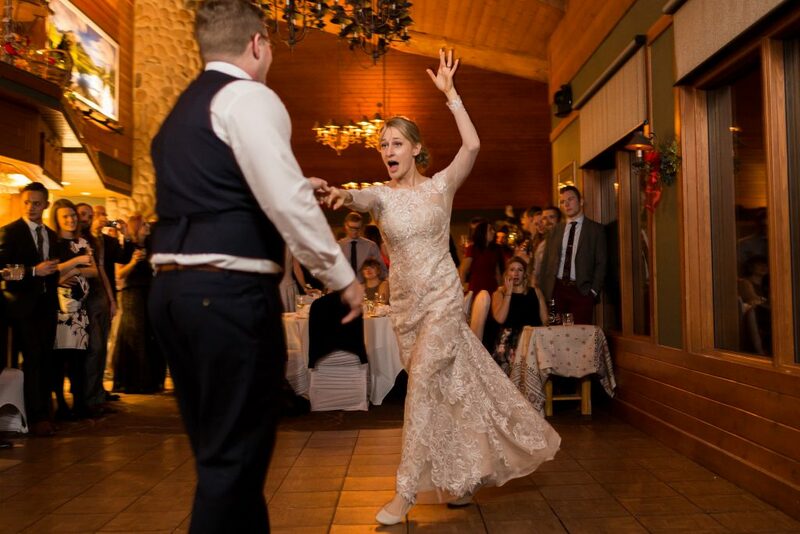 Both bride and groom made it their mission to dance the night away, even if it meant a few wardrobe malfunctions. 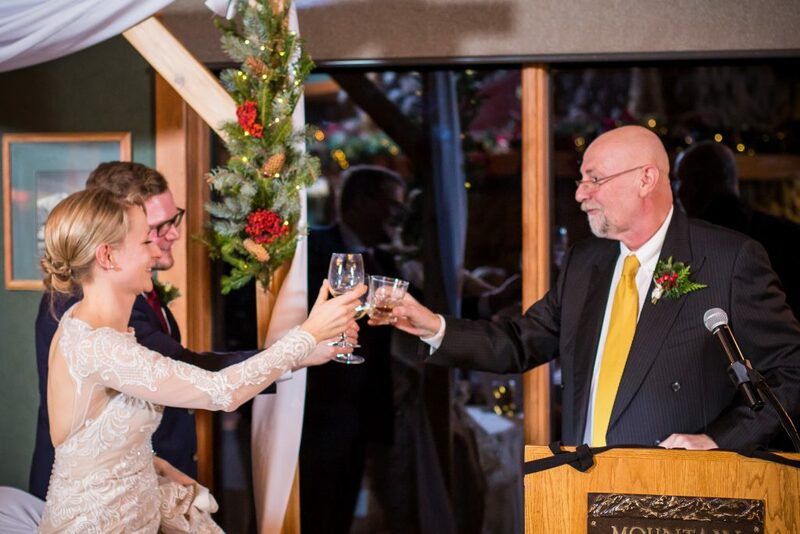 Congratulations to you both and to your families! 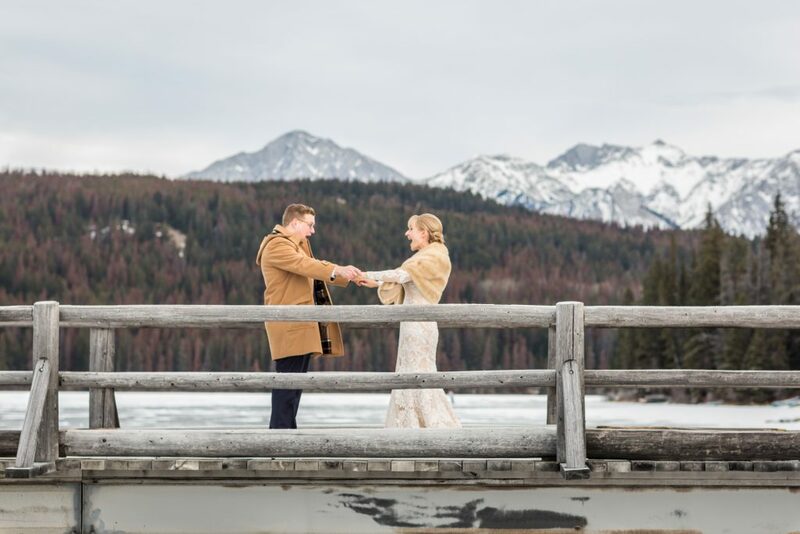 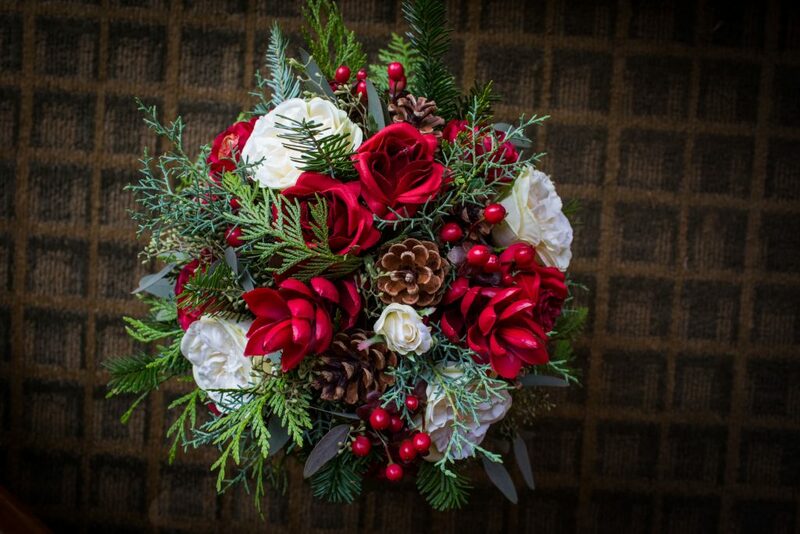 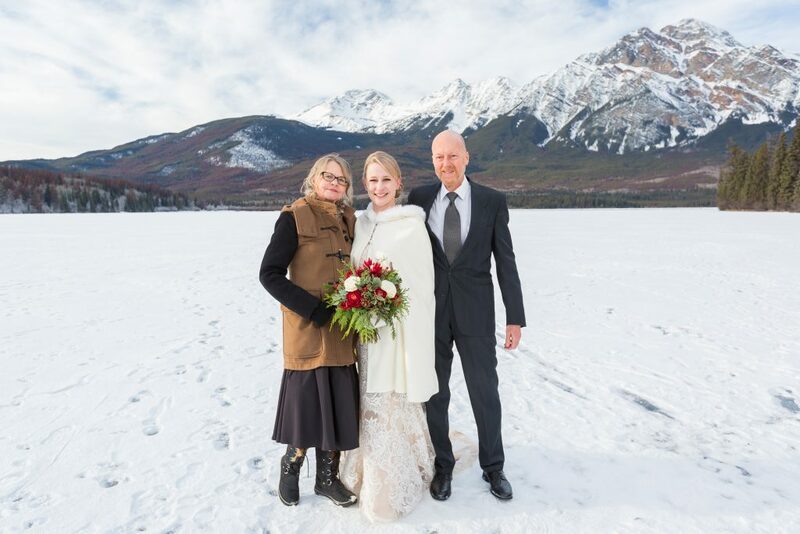 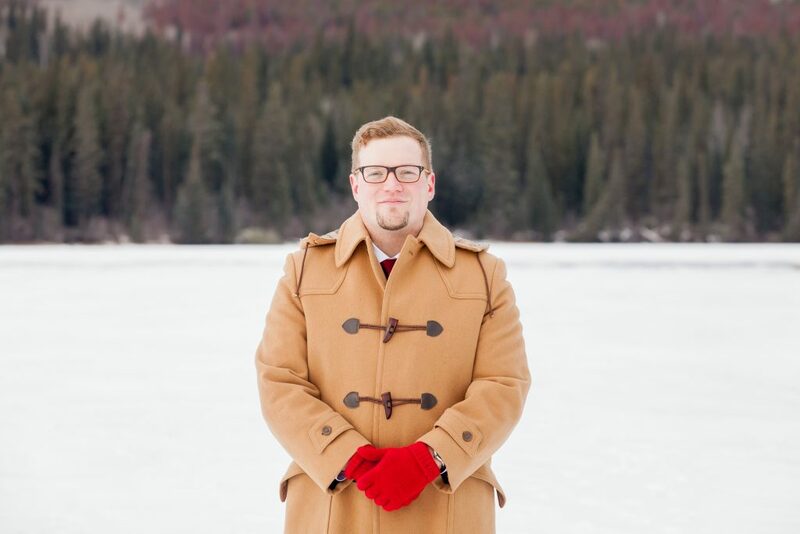 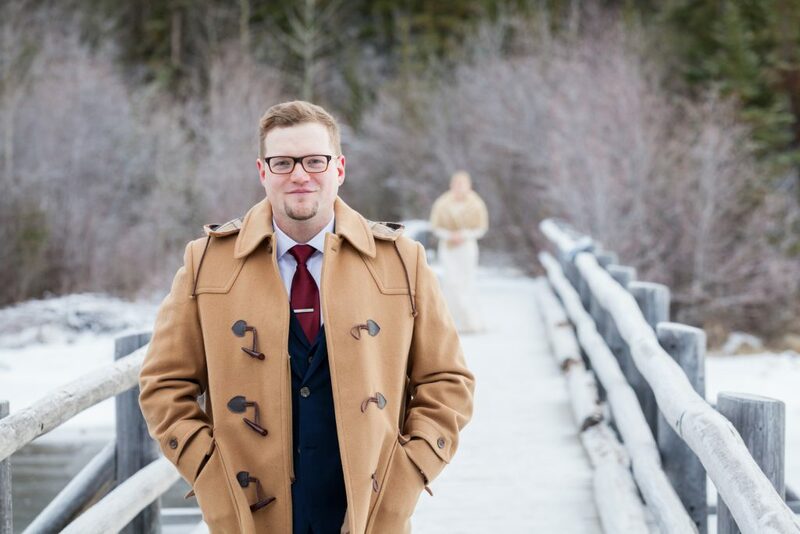 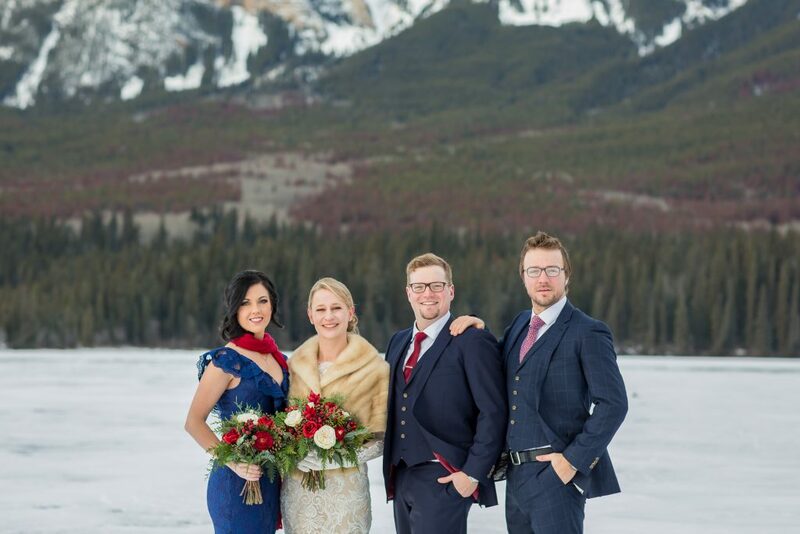 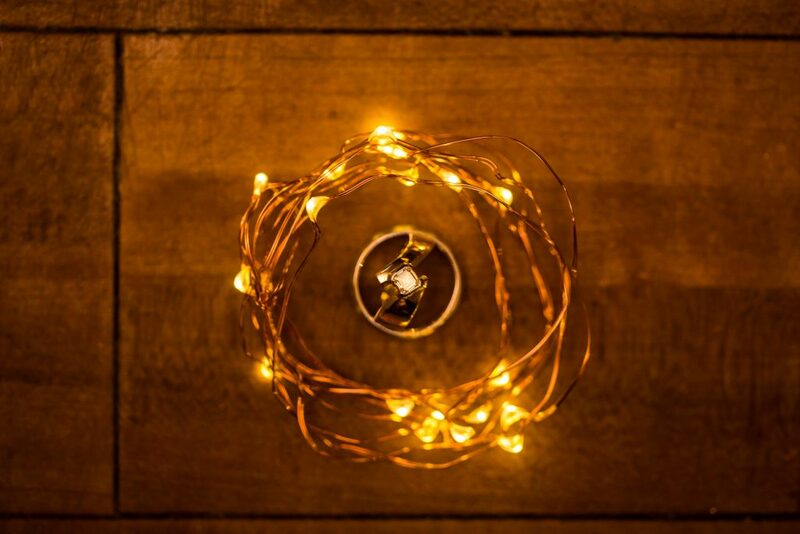 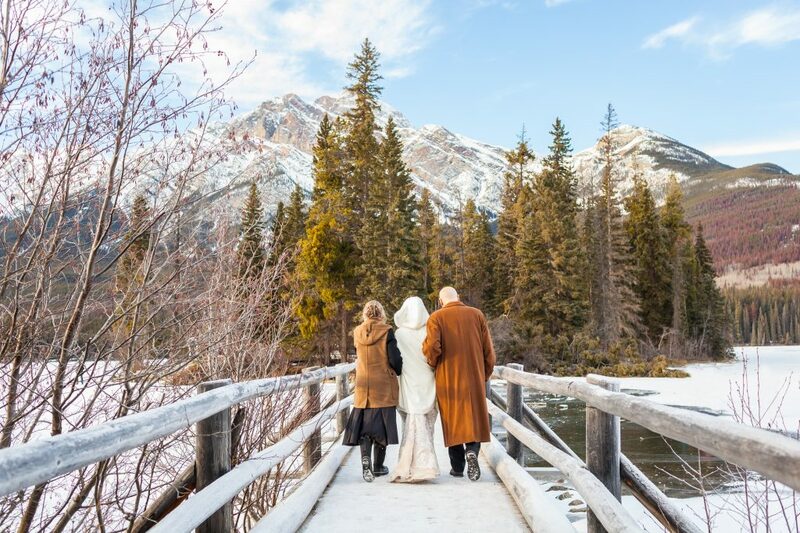 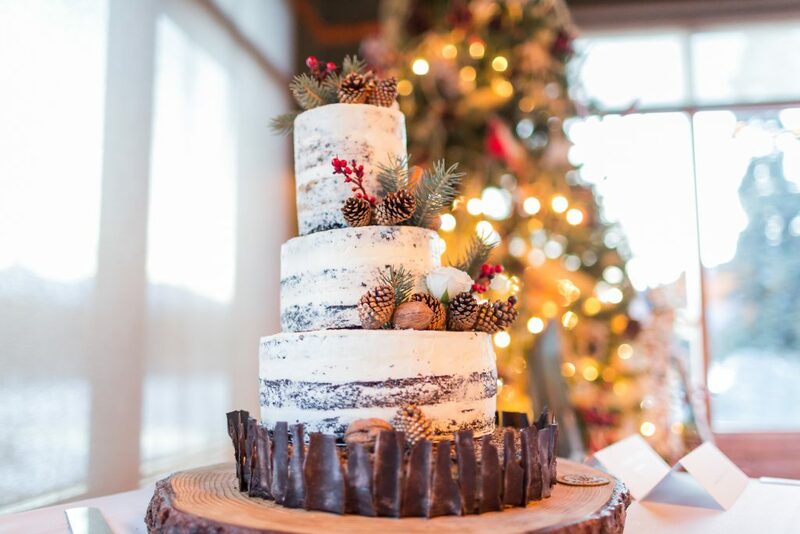 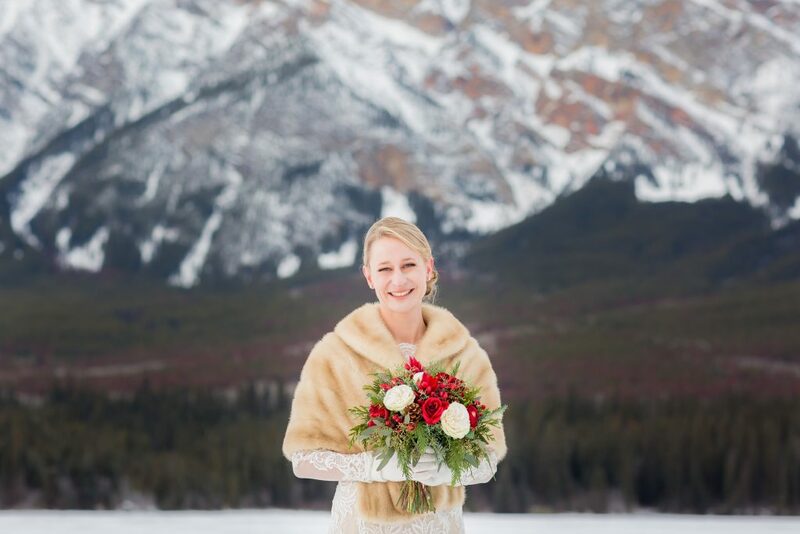 Thank you for inviting Deep Blue Photography to photography your gorgeous winter wedding at Pyramid Lake. 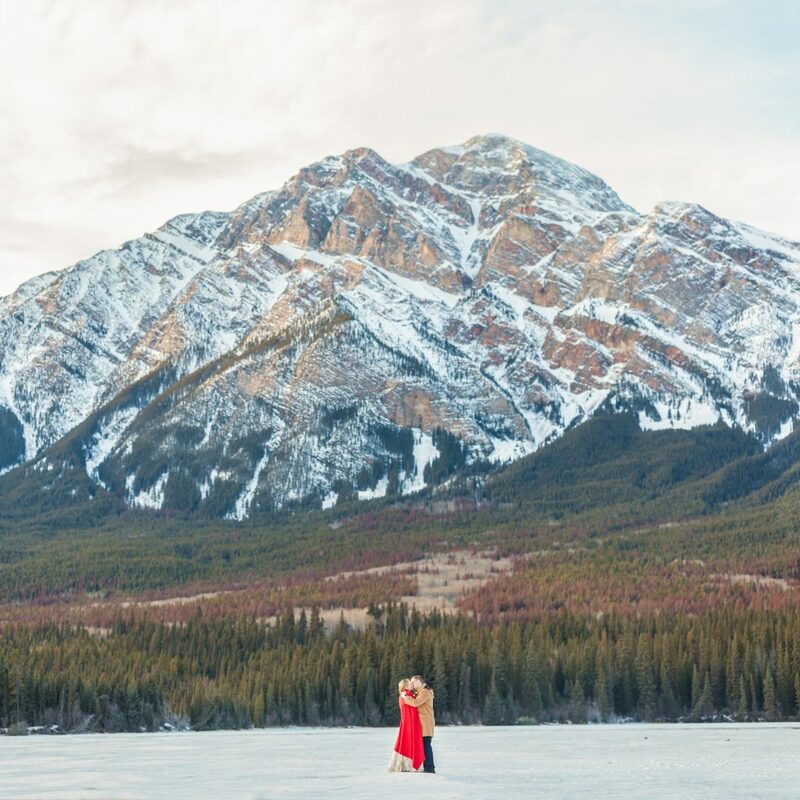 To view more gorgeous mountain portraits, check out our best winter spots in Banff!